If you studied the writing equations unit, you learned how to write equations given two points and given slope and a point. We are going to use this same skill when working with functions. The only thing different is the function notation. 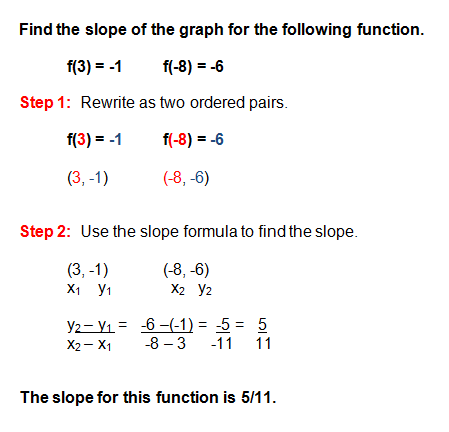 You first must be able to identify an ordered pair that is written in function notation. This can be a little tricky, but hopefully when you see this example, it will all make sense. Remember that "f(x)" is really just a fancy notation for what is really the "y" variable. Ok.. now that you know how to write an ordered pair from function notation, let's look at an example of how we must use function notation to graph two points on a grid. Ok, that was pretty easy, right? Yes...now do you see how Math has that spiral effect? You already knew this skill, but it's coming back in a different format. Next we are going to take it one step further and find the slope of the graph for a linear function. Take a look at this example. Is it all coming back to you now? Remember that in this particular function lesson, you really aren't learning any new material. 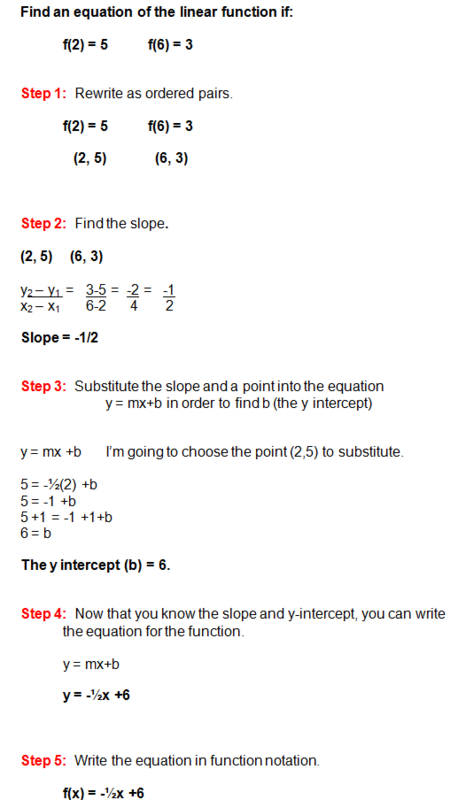 You are applying what you know about equations and simply stating your answer in a much fancier format. We will continue studying linear functions in the next lesson, as we have a lot to cover. Keep going, you are doing great!